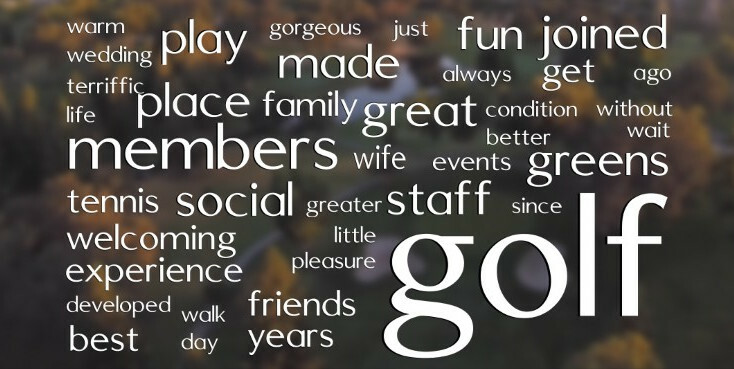 The “word cloud” banner at the top of this page represents the actual words of Sierra View members: All of their comments and reviews were run through a histogram function, each word weighted for the number of times that it appeared, and the top results fed into a word cloud generator. Full Service – Sierra View Country Club is a full service private club, with golf, tennis, social events and dining. Family Fun Events – A full calendar of adult and family-oriented social events. Probably the most well-known, long-standing traditional family event is the 4th of July where hundreds of members and guests come to Sierra View for a barbeque dinner, activities for the kids, great live music, followed at dusk by an impressively long fireworks display on the eighteenth fairway, seen for miles around. This annual event has become a must-do for members and returning guests who bring their blankets and lawn chairs and cameras to capture these memorable moments. Twilight Golf Evenings – A monthly Nine and Dine event April through October. Members can bring guests which is a great way to showcase the fun times at the Club. Meeting Room Rental for Members – Sierra View members can arrange to host a party or gathering with the room rental fee waived. Online tee times and tennis court reservations. Online dinner and event reservations. Golf club storage and push cart storage. Locker rental – for nominal monthly fee. Locker rental includes a free shoe shine every week! Drop by after work in the afternoon and walk onto the course – play as many or as few holes as you want. Play two balls if there is nobody behind you (can you do that at a public golf course?). Young golfers can bring a friend for $5 accompanied by the member parent. Unlimited driving range access – sunrise to sunset use of our practice range, six days a week, with premium range balls, with an extra large grass hitting area. Plus a bunker practice area and chipping practice area to groove your sand, pitch and chip shots. The practice areas (we call it the “Golf Academy”) are newly renovated and beautifully designed. Fun Social Events Galore – too many to even list here. Golf and Tennis Tournaments throughout the year. Reciprocity at other private golf courses through the Gold Card Program and the Private Club Network. If you think playing the same course month in and month out will not be interesting enough, golf members enjoy reciprocity at many other private clubs for a nominal green fee. Sierra View management will help arrange your golf travel experiences. Contact Mark Harris – 916-783-4600 ext 21 – mharris@sierraviewcc.com, for more details or to schedule a private tour.